Goose Creek real estate is ideal for people who want to live near Charleston but want to avoid the high housing prices associated with living in Charleston County. The majority of homes in Goose Creek are about a 30 minute drive from downtown Charleston and 45 minutes from Folly Beach. Because it is further inland, house prices in Goose Creek are much more affordable than the suburbs immediately surrounding Charleston. Most home buyers in Goose Creek opt for newer construction communities like Crowfield Plantation and Liberty Hall Plantation because these offer some of the nicest amenities and tend to be some of the best maintained neighborhoods in Goose Creek. 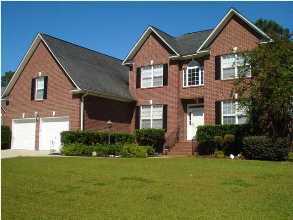 Crowfield Plantation is one of the most desirable neighborhoods in Goose Creek, SC. Although it’s made up of mostly single family homes, you’ll find a handful of townhouses for sale at any given time. Crowfield Plantation is the largest of Goose Creek’s communities, with almost twenty subsections total. (The Hamlets is the most sought after of these subsections because it has some of the nicest homes for sale and also because it overlooks the golf course and the community lake, which is pictured below.) Crowfield is known for its traditional home designs, many of which are either solid brick or have brick front exteriors. Home buyers in Goose Creek often have trouble finding neighborhoods with amenities because most communities are simply trying to maintain the most affordable homes and neighborhoods around. Crowfield Plantation is ideal for these home buyers willing to pay for amenities because you won’t find a community that offers more amenities in the area. 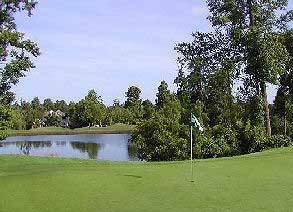 Crowfield boasts the only golf course in Goose Creek, a club house, swimming pool, tennis courts, kids’ playground, boat and RV storage, and several miles of walking/jogging trails. There's also a baseball field nearby that's within walking distance to most of these homes. 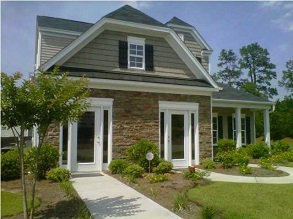 Crowfield Plantation offers some of the most affordable homes overlooking a golf course in the entire tri-county area. (If you're wanting to buy a home on the golf course, be sure to check out The Hamlets subsection, which is where all of these homes are located.) Golf Digest has rated the course with 3.5 stars, and it has a 73.7 USGA rating. This 18-hole golf course features over 7,000 yards, and it’s an accessible course for both beginners and seasoned players. The Crowfield Golf Course opened in 1990, and it was designed by Bob Spence. Liberty Hall Plantation is a great new construction neighborhood for buyers in the under $250K price range. The most popular subsections tend to be Foster’s Creek and Sedgefield, where buyers can choose from a large inventory of proposed construction and newly finished homes in addition to the pre-owned homes that have been built in the past five years. Liberty Hall has mostly single family houses, but you’ll find a very small selection of townhouses in the Wedgewood and Waterford subsections. Located off Hwy 52 in Goose Creek, Liberty Hall Plantation is ideal for home buyers who need more house but have a limited budget. Here, you'll be able to find that 2,500 sq ft home with 4 or more bedrooms for less than $250K. (A home this size in most of the Charleston County areas would cost $300-350K.) Buyers tend to also like the amenities in Liberty Hall Plantation, which include a swimming pool, club house, and kid’s play park. 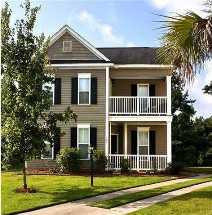 Brickhope Plantation is another new home community in Goose Creek that is quite comparable to Liberty Hall. 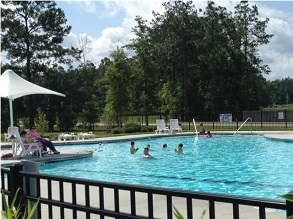 Brickhope Plantation does not have as large of a selection of homes for sale, but it suits the same price range and offers the same basic amenities such as a pool, kid's playground, and club house. Current home pricing ranges from the high $100's to the high $200's. Right now, Brickhope Plantation has a good inventory of houses that are under construction (or about to start construction), which is especially appealing to buyers who want to be able to pick out all of the features of their new home. This neighborhood is located off Montague Plantation Road, which gives easy access for Goose Creek commuters on Highway 52. Brickhope Greens has a wide range of home designs, from very basic plans in the $150K range to larger designs with exteriors boasting stone work, gables, and multiple rooflines. Brickhope Greens does not have any amenities, which makes it overall one of the most affordable new construction communities in Goose Creek. Also, if you're looking for a one story home, this is going to be a good community to start your search because it tends to have more options to choose from. Brickhope Greens is located off Hwy 52 next to Liberty Hall Plantation. This section of Goose Creek is just a few minutes' drive from the Felkel Field Sports Complex which offers great athletic options from the Recreation Commission. Most of the homes in Goose Creek are ranch-style houses that were built around the 1980's. However, the area also has newer residential communities like Crowfield Plantation and Liberty Hall Plantation that have been developed to accommodate a growing demand from home buyers. Goose Creek is one of Charleston's fast growing outlying suburbs, attracting buyers with its mix of convenience, low home prices, and easy access to hunting and fishing. Saddling the traditionally rural corridor between North Charleston and Moncks Corner, this area offers exciting opportunities to home buyers. Although it was only established as an independent municipality in the 1960's, Goose Creek has been a vital part of Charleston and Lowcountry history since the late 17th century when the area was a valuable center of Indian trade. Now, as an intersection between Charleston and Berkeley County, Goose Creek is conveniently situated along Highway 52, near Interstate 526. It is a thirty minute drive along I-26 to downtown and forty-five minutes to Folly Beach. Travel to fishing and hunting opportunities in Berkeley County are, likewise, only thirty minutes away. The addition of planned communities of multi-family dwellings to the traditional single-family units in Goose Creek has added the spice of greater population density without compromising its low-key atmosphere. This area is an excellent choice both for first time homebuyers as well as those interested in starting or raising a family. As this area is farther away from downtown Charleston, housing prices here are traditionally lower than can be found in many of Charleston's other outlying suburbs. A single-family home on its own lot can often be purchased for a comparable price as a townhouse or condominium on James Island, Daniel Island or West Ashley. Goose Creek is the location of choice for those commuting to work in North Charleston, Moncks Corner or Summerville because of its centralized location in Berkeley County. Also, the easy commute from Goose Creek to both Trident Technical College and Charleston Southern University make it an ideal location for students living at home or an investment property for parents. Shopping can also be found in nearby North Charleston, along with a multitude of retailers from Wal-Mart, Lowe's, Best Buy and Barnes and Noble, to smaller specialty shops. The numerous shops of Tanger Outlet Mall is also only a short fifteen minute drive into North Charleston via Interstate 26. Dining establishments, from gourmet restaurants to convenient diners, are also available and sure to please every palate. Buying or Selling a Goose Creek Home? Call 800.804.2187 or contact us online to learn why The Keadle Group is one of Charleston's top performing real estate teams!